Computer safety – be it personal or a public computer is one necessary thing. Most of us have Personal Computers near us, almost every time. That’s not the case when you travel, though. In some way or another, you may be forced to use a public computer on the go. This may be at an Airport or when you can’t access your laptop or smartphone. Even worse, you may be stranded in some place without internet connectivity, where the only resort is a public Internet cafe. We all know that public computers are never really safe as personal ones – and, computer safety is something tougher than you think. 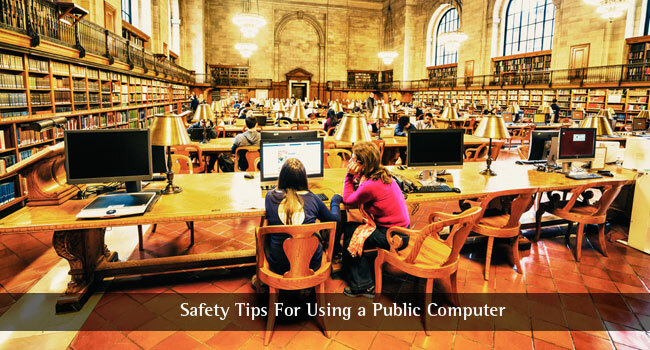 Hence, you should follow some safety tips while using a public computer. Otherwise, you may end up losing your data, privacy and money. Most of these tips are seemingly simple. However, they can have a huge impact as far as your privacy is concerned. Here, we have made a list of some must-follow computer safety tips. As a matter of fact, you may know many of these. Nevertheless, all of us should take a true, conscious effort to follow these steps and to attain highest-possible privacy and security. Most websites now offer a personalized version – be it your banking website or a favorite newspaper. That having, you may have to neglect the benefit while you’re on a public computer. If you can access a particular service without logging in, it’s highly recommended. 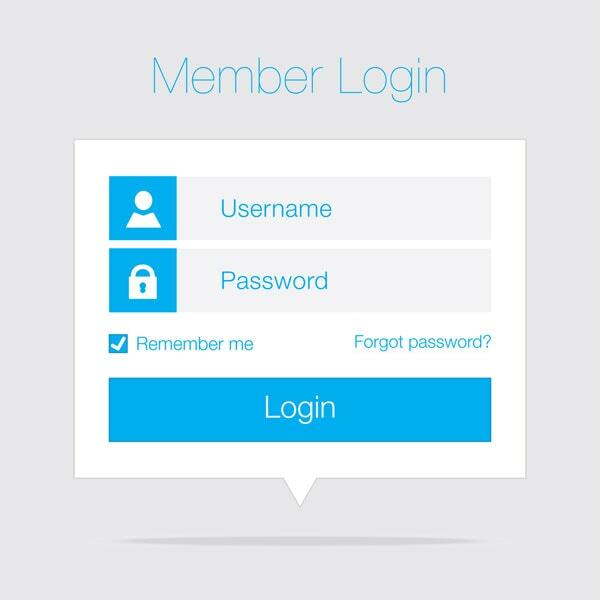 By refraining from logging in, you are actually reducing the chances of privacy loss and data theft. If you leave nothing to be tracked, what are the hackers going to get? This is the golden rule for using a public computer; no matter what the purpose is. You might have logged in to several services and websites, but it’s necessary to log out from them. You may have the habit of simply closing the window while using personal devices. That’s the worst thing you can do if you’re on a public PC. The next user may have access to your account, especially if you had enabled ‘Stay Signed In’ option. So, the next time you use an Airport computer, check twice that you have logged out of everything. 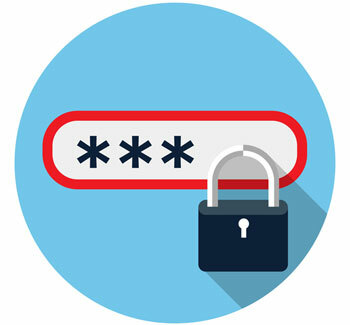 Nowadays, every web browser comes with the feature to save your login credentials, including username and password. The problem is that some browsers may automatically collect such information. Well, you might see a prompt, but ignoring the prompt would automatically save the credentials. As you can guess, this can put you in all sorts of trouble. So, if it’s necessary to log into a web server, make sure that you don’t enable the Save Password option. We had given this suggestion when you wanted to clean Junk files from Windows PCs. We had also told you that it’s a great way of privacy protection. So, once you have completed your session in public PCs, it is necessary to clear all the temporary internet files. These files include cookies, passwords and other scripts that may be used to track you down. Every web browser offers an option for this and you can find it quite easily. For instance, if you are on Google Chrome, you can go to Settings More Tools Clear Browsing Data. In the next pop-up, you have to select the data you need to be cleaned. We recommend clearing everything, such as Browsing History, Download History, Cookies and Other Plug-In Data, Cached Images and Files, Passwords, Auto-fill form data, Hosted App Data and Media Licenses. Even better, the next time you are on a public PC, stick onto private browsing – Incognito if you’re on Chrome. By going Incognito, you are getting rid of the issue of being tracked too. In other words, you leave no trace to be seen on the public computer. If the Data Clearing is followed by a simple process of System Reboot, you can make things ultra-secure too. It’s never recommended to do online financial transactions if you’re on a public computer. In fact, you must be careful even if you’re on your personal device. So, things become more vulnerable if you’re on a computer that thousands of people use. There are many possible reasons why you should refrain from these financial transactions. First of all, the computer may be using some hardware or software-based key logging system to get your information. It means that your credentials can be theirs in a few seconds. The same goes with Credit Card transactions. 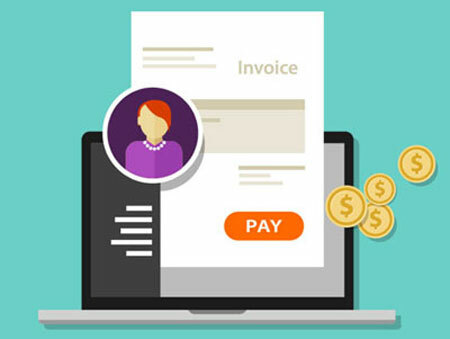 Using the same key-logging methods, hackers can collect a lot of information about your payment method. There’s another catch too when you’re doing credit card-based payments. Some browsers now come with options to save Credit Card information for later use. The feature can be misused by a hacker or attacker to steal your information. Moreover, there’s no surety that you are visiting the genuine website via the computer. Public computers can easily be victims of DNS Spoofing. Considering all these, it’s safe to stop yourself from online transactions as long as you’re on public devices. You might be missing something, but that’s way too better than demolishing your whole bank account. When you download something, you are leaving a mark for tracking. So, for the sake of advanced safety, it is recommended not to download anything to a public computer. You might have downloaded a simple email attachment, but it may contain sensitive information. Nowadays, even your complete email ID is enough for causing trouble. So, even if you download something from the web, make sure that you permanently delete it from the PC after your purpose. Another secure method is to preview them via Email service itself. If you’re on Gmail, you don’t need third-party desktop apps to open docs. Quite easily, you can open almost any document in the email page. This is way too better, because you’re downloading nothing. There is another advantage if you stop yourself from downloading files, especially if you’re on a friend’s PC. You are actually helping the PC to stay faster – you know; less files means less lagging. There is another way how hackers collect your private information – by looking closely. Unless you have a higher typing speed, one can easily understand what you are typing. He/she just need to keep looking at the finger movements. So, if you value your privacy, you need to make sure that no one is prying on your online activities. At the least, you must know that there’s no one behind you. By looking over your shoulders, anyone can understand what you’re typing. There is another method I personally use if I think someone is looking at the keyboard. The idea is to confuse their eyes by hitting a lot of backspaces and spaces. When you are not typing the password sequentially, it’s quite tough to understand the content. Also, if available, you can use a Virtual Keyboard. However, if you ask me, I’d recommend the messing-up method, which is great. Also, it’s about using some common sense, before you start providing confidential information through public systems. This really depends upon the system you have at the public space. However, in most devices, there is one option named Guest Mode, especially in macOS. This works like a common computer, but you may lack the administrative privileges. The best part here is that your records will be deleted once you log out. This is an awesome way to stay secure, regardless of the platform. You are literally leaving NO way to track you down. Still, we do understand the method might not work in all scenarios. Not every public PC may have an option for being Guest. Public computers are always filled with nasty adware and spyware, believe us. Hackers take a truly conscious effort to make these devices vulnerable. Even a single bad step from your side would put you in great trouble. One of the pitfalls you can find in these devices are those unnecessary Toolbars and annoying Ads. Toolbars are in most cases Trojans and keyloggers. They stay in the web browser and collect information from what you are typing or pasting. Once you have finished your session, it’s recommended to reboot the public computer. This reboot will be clearing a lot of temporary information from the device. Do you know that some temp data is stored in RAM memory as well? Well, yes, but a Reboot process should be quite helpful for removing them completely. It’s going to take just a few seconds, but it will help you like never before. Just like we talked about the clearing temporary files process, this will help the next user ;) You know, a good restart will refresh the PC. This is an advanced option for ultra-secure usage of the public computer. All the problems of being tracked do happen when you access the default OS of the computer. What if you’re booting another OS in the device? That is what happens when you use a USB or CD Drive as an external boot device. Every computer supports an option for loading external boot drives and you can find the hotkey in a single Google search. So, after you reboot the computer, hit the button and choose your USB Drive. It’s always recommended to set up an externally-bootable Linux Distro in the USB. However, there are some other versions as well. Obviously, there are a few advantages. First, no matter what the default OS, you can have the same old Desktop feel you have at home. However, even in this case, it’s not safe to save files to device HDD. On the other hand, once you have booted up the external device, you have an ultra-safe way to browse, share information and explore the web without issues. More often than not, there are hardware spying methods on public PCs. It may be a simple USB stick or one adaptor connected to the keyboard. 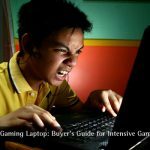 However routine it may be, it’s highly recommended to check computer hardware before proceeding. It will have a huge impact on your overall safety, you bet. We have seen some hardware-based key loggers in internet cafes out there. They aren’t easily detected but keep stealing every keystroke you make. Well, these are our curated computer safety tips for using a public computer. As you can see, it requires a conscious and tedious effort to attain better security. For instance, you cannot stay ignorant about spying and keylogging. Not just that, you need to take the right precautions as well. We believe, these tips will help you stay secure in the world of web and digital threats. After using public computer, I just clear all history, cookies, temp files, etc from computer and do not type password in front of any stranger. That’s a very good measure for computer safety at public places. I don’t usually use public computers but you never know one day I might. It’s an excellent idea to erase history, cookies, and temps files. Not typing your password when someone is around you is a great idea. People are so curious they always try to take a peek. I like what you have acquired here, very helpful tips.